Our indoor pool is heated to 32-34 degrees Celsius all year, depending on the season, for the comfort of our swimmers. It is designed specifically for pre-school and primary aged children and is enclosed and purpose-built for swimming lessons all year round. The water is continually filtered with a two hour turn over period. We have a state of the art chemical control system and use a synthetic filter media to ensure pristine water clarity and hygiene. 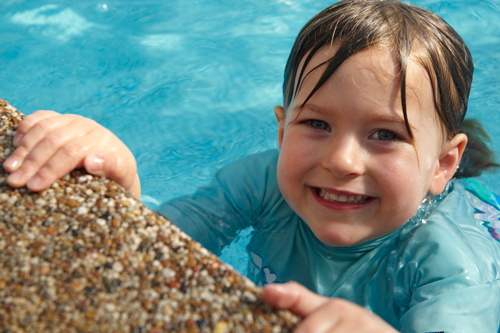 Water quality is regularly monitored and meets all NSW Health Department guidelines. Only one class is taught in the pool at any one time. This ensures minimal distraction for the children and maximises their ability to learn. Children learn by doing and watching as well as listening to the teacher. With only one teacher and one group in the pool at any time we can create the ideal learning environment in warm water. 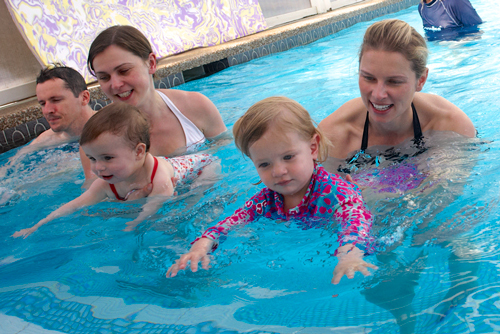 Our pool temperature helps children relax in the water and is particularly good for nervous, slim and asthmatic children. Parents are welcome to stay in the air-conditioned reception area and watch their child’s lesson through the glass sliding doors that lead into the pool. If you prefer, you may choose to sit in the beautiful outdoor garden under the umbrellas overlooking the pool. The comfort of our parents is important and we continually upgrade our reception area to better meet your needs. Both the reception area and shower and toilet are wheelchair accessible. Baby change tables are provided for safe management of babies before and after lessons.